Below are some of the finds from the Blendon estate. A rare and unusual brass spoon was found by a resident while working in his garden. The British Museum believed it was of German manufacture and could date from the 15th to 17th century. However, Bill Brown, cutlery historian, suggested 14th century and that it might come from the Netherlands, stating that spoons were often found in old compost heaps. Unfortunately the spoon was not found in its original setting. Intriguingly, the bowl of the spoon has a simple engraving of a religious building on it. Local residents have uncovered two clay pipes with bowls fully intact. One pipe, dating from the Civil War period in the mid 17th century, was found in The Drive. Blendon was a Royalist stronghold in the Civil War and its occupants were important players in the conflict, especially Sir Edward Brett, who was knighted on horseback by King Charles I. 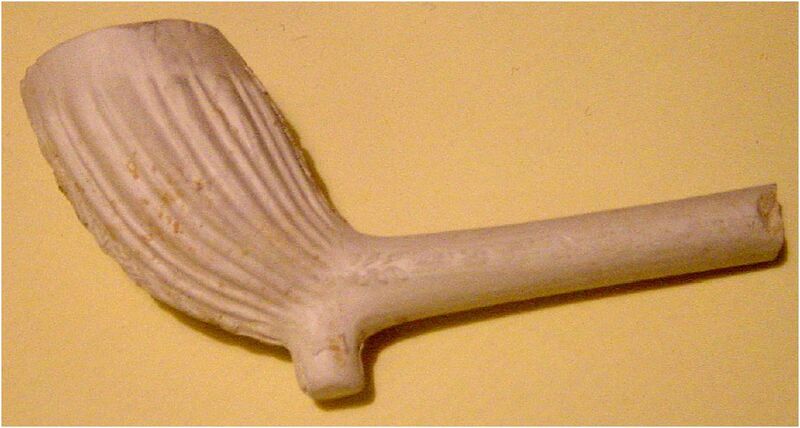 The other pipe, found in Beechway, dates from the 19th century. Three coins have been found. A well-preserved halfpenny dated 1733 was found in the grounds of the Bailiff’s Cottage (which was not built at the time). A penny was found in the Pleasure Gardens (near where the top lake was located) dated 1740-45. Another coin, dating from the 1730s, was found in the joists of Jay’s cottages, apparently placed there to ward off evil spirits. Bricks dating from the 18th century, including coving bricks, have been found in Beechway. Iron fencing, which appears in a number of photographs of Blendon, has mostly been removed but does survive in places. Footings of the walled garden have been found on the south side of The Drive. The walls measured 15″ across and were a notable feature of the Estate. A beautiful glass candlestick holder, probably 19th century, was found in the area of the domestic end of the hall. A set of candlestick telephones was retrieved from a garden in the Drive about 2 feet below ground, still having remnants of the Hessian sack on them. Why would someone have deposited them in the lake (as it was then)? Other artefacts from the Estate include a chimney pot (now an unusual flower pot in a garden), a ‘toadstool’ that supported a granary store, a gatepost, and part of a track that led to the walled garden. There is also a small memorial stone in a garden in Beechway with the inscription: ‘To the memory of Karl – October 23rd 1852’. Karl was a horse and this area of the estate was the pet cemetery.